“Support” and “surface” mean the same thing in French as they do in English, an accident of language that mirrors the immediacy of Supports/Surfaces, a self-titled exhibition of paintings, sculptures and category-skipping hybrids from a little-known art movement based in the south of France. The works in the show may seem as if they are coming from an unusually cohesive group of brash (if highly refined) young Gallic upstarts, except that they were made before today’s brash young upstarts were born. Beautifully installed at CANADA on the Lower East Side, the exhibition (presented with the participation of Galerie Bernard Ceysson, which has outposts in Paris, Luxembourg, Saint-Étienne and Geneva) spans 1967 through 1983, with the bulk of the work coming from the early to mid-70s. This was a time of worldwide political unrest, with 1968 as the epicenter, a year that began with the Tet offensive — North Vietnam’s decisive psychological victory against the United States — followed by the assassinations of Martin Luther King, Jr. and Robert F. Kennedy, the crushing of the Prague Spring by Soviet tanks, the police riots at the Chicago Democratic National Convention, and the election of Richard M. Nixon. It was also on May 6th of that year, known as “Bloody Monday,” that thousands of student demonstrators in Paris engaged in their most violent confrontation with the police, kicking off a monthlong wave of protests that succeeded in temporarily shutting down the government as President Charles de Gaulle fled the country. The exhibition’s press release states that “Many of the artists involved with Supports/Surfaces were veterans of the war in Algeria, and as young artists and citizens they were looking for alternatives to the colonial war machines that seemed to be the norm in western society.” The Algerian War of Independence was, like America in Vietnam, a conflict that brought into question the moral foundations of society. Hostilities ended in 1962 after referenda held in France and Algeria approved independence, though the last French forces left in 1967. Supports/Surfaces was a loose confederation of about 15 artists mostly from the south of France (Nimes, St. Etienne, Nice, etc.) who made work marked by an interest in materiality, expansive ideas of what a painting could be and often a lyrical use of bright color. There is no manifesto, but the writings and ideas of Freud, Marx, Clement Greenberg, Michael Fried and Chairman Mao were tossed together along with a deep interest in Matisse, another artist associated with the south of France. Although these breezily rigorous works, which are roughly contemporary with Minimalism and Conceptualism in the United States and Arte Povera in Italy, put forward a refreshing take on the strictures of formalism, their sociopolitical background provides an additional layer of interest. For one, there seems to be nothing more incompatible than a group of young artists “looking for alternatives to the colonial war machines” and Henri Matisse, the Grand Old Man of Modernism whose forays to Morocco, which shares a border with Algeria, can be viewed through a postcolonial lens as a form of aesthetic hegemony. It is Matisse’s sensuality, however, that sets the Supports/Surfaces group apart from its Puritanical counterparts in the U.S. and the Italians’ back-to-the-earth abject-affect. In the CANADA exhibition, the colors are much more vibrant than anything found in Minimalism or Arte Povera — often applied through staining in the manner of the Greenbergian Color Field painters — and the supports are mostly unstretched sheets of fabric (including a striped dishcloth) pinned to the wall. As the name of the movement suggests, there is an integral bond between the material used as a support and the medium that determines what the viewer perceives on the surface. The Supports/Surfaces artists represented here are André-Pierre Arnal, Pierre Buraglio, Louis Cane, Marc Devade, Daniel Dezeuze, Noël Dolla, Jean-Michel Meurice, Bernard Pagés, Jean-Pierre Pincemin, Patrick Saytour and Claude Viallat. 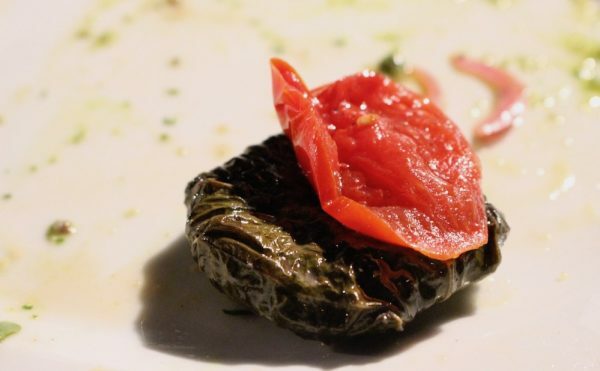 There are striking similarities among many of the works (in a long, informative essay that appeared in artcritical in 2004, Raphael Rubinstein writes that the group’s members “clearly were engaged in a common esthetic project” and conducted “their internal relations like a communist cell”), not least of which is the prevalence of blue, white and red, which make up the French Tricolour as well as the American flag. There are also paintings that feature green, white and red (as well as yellow, the ingredient that changes blue to green), which are the colors of the Algerian National Liberation Front and, later, Algeria’s national flag. Louis Cane, “Toile tamponnée (“Stamped Canvas”)” (1967), ink on canvas, 130 x 94 inches. 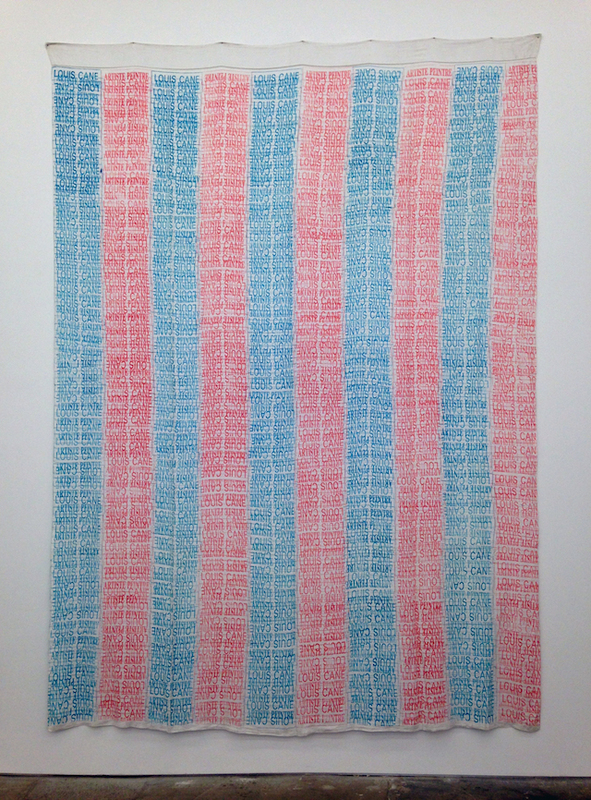 Taken in this light, a sly, Pop-inflected ink-on-canvas painting by Louis Cane, “Toile tamponnée” (“Stamped Canvas,” 1967) seems explicitly geared to be read as a critique of both capitalism and the art market, with its blue-and-red-on-white striped color scheme composed entirely of the words “LOUIS CANE ARTISTE PEINTRE,” a sendup of branding decades before it became an artistic goal. 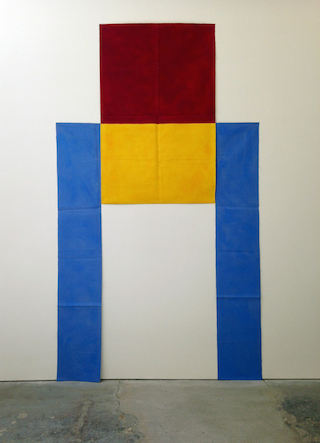 A second offering by Cane, “Toile découpée” (“Cut-Up Canvas,” 1970), is a large, handsome oil painting in which two blue, pillar-like canvas strips flank a shorter, wider rectangle in yellow and red that’s mounted two-thirds of the way up the blue ones. The positioning of the canvas sections creates a kind of imperial gateway, but, again, subversion appears to be afoot, as the sheets of fabric, pinned to the wall, have no heft of their own, underscoring the illusion inherent in their monumentality. “Toile découpée” is the centerpiece of the rear wall of CANADA’s main room, where the paintings on either side play out the blue, white, red, green and yellow schema with a clear, clean geometry. 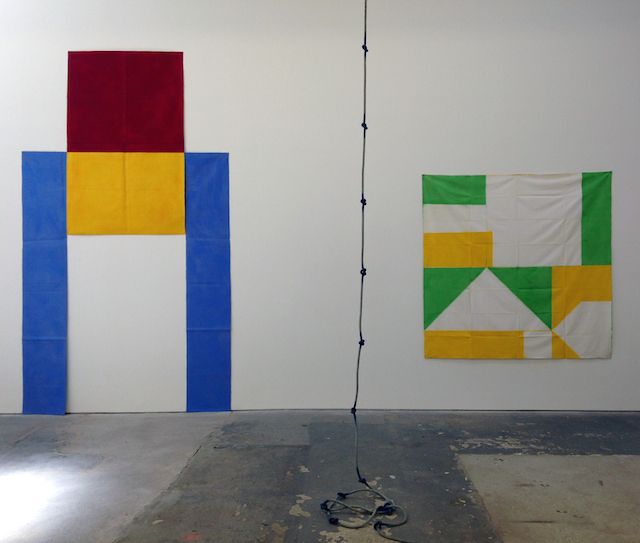 To its left, two untitled ink-on-canvas paintings (the only ones in the show using stretcher bars) from 1967 by Marc Devade are simple geometric interplays of red and white (on the right) and red, blue and white (on the left), while André-Pierre Arnal’s equally geometric green, yellow and white “Pliage” (“Folded Painting,” 1971), made with spray paint on a noticeably creased canvas, is, like “Toile découpée,” both a painting and an object. Another folded painting, also called “Pliage” (1973), is by Patrick Saytour, in which rows of lozenge-shaped red blots are stained, Rorschach-like, with dark blue spills on a white canvas. The maculate tricolor arrangement comes across as an overt assertion of the group’s political tilt, as does another of Saytour’s works, “Déployé” (1970), which applies a military term (deployed) to a row of red flags mounted on tall plastic poles that, despite their faded tinge of salmon, seem likely to refer to the banners carried by the revolutionaries of May ’68. Saytour is also represented by an untitled floor sculpture from 1974, which is made up of tightly packed bolts of fabric rolled into bundles. Many of them are enlivened by swatches of color across the top that resemble oversized lipstick traces in red, pink, blue or purple. These objects recall the bundled lengths of felt created around the same time by Joseph Beuys, another former soldier on the wrong side of history. A nearby openwork lattice in wood — “Échelle de bois souple” (“Ladder in Flexible Wood,” 1974) by Daniel Dezeuze — is attached to the wall but curls into itself as it hits the floor, which also brought Beuys to mind in the form of the toboggan that he displayed in concert with the felt (both being references to his now discredited World War II survival tale). This is the only piece by Dezeuze in the show, but its form is echoed in the works of two other artists. Noël Dolla’s “Tarlatane” (1976) — the title refers to an Indian textile — is made of white gauze stained with streams of blue and red acrylic. It is hung so that the painted surface is facing the wall, exposing the stained underside of the gauze until, like Dezeuze’s “Échelle,” it reaches the floor and rolls up, revealing the more vividly colored recto. This work, though mildly gimmicky, could be seen as a signature example of the group’s fusion of support and surface. Dolla also did a painting on the above-mentioned white dishcloth, in which trios of brown dots create a pattern between a border of green and red stripes. The show also includes two lattices made out of rope, dated 1970 and 1972, by Claude Viallat. These are both colored red, but the earlier, smaller work, “1970/F007,” is pinned to the wall while the later, larger one, “1972/F14,” hangs from the ceiling and coils on the floor. Another rope piece from ’72, “1972/C028,” which also hangs from the ceiling and coils on the floor, consists a single length that is knotted like a climbing rope and sprayed with patches of blue. The titles of the artworks in this show, when they are used at all, are mostly matter-of-fact, referring to materials or processes (as in “Vinyle,” 1976, Jean-Michel Meurice’s cheerful collage in red and pink vinyl), but Viallat’s come closest to the inventory-like regimen of American-style Minimalism/Conceptualism, such as Sol Lewitt’s “Wall Drawing #122: A 36″ (90 cm), grid covering the wall” (1972) or Donald Judd’s “Untitled (7-L)” (1968). Viallat’s work, as evidenced here and on Galerie Bernard Ceysson’s website, also appears to be the most punctiliously serialist of the group. He has two other pieces in the exhibition, both paintings, that use the same stencil, which takes the shape of an abstracted torso — something Matisse might have come up with for his collage suite, “Jazz” (1947) — repeating it across the surface in horizontal rows. In “1972/108” (1972), the shape is in gray ink on a single rust-colored sheet attached to the wall. The emblematic “1970/056” (1970), however, consists of three parts made from loosely hanging white fabric: a triangular central section where the stenciled shape is in blue acrylic, and two diagonally-oriented wings, where the shape is repeated in orange. There are correspondences here to the Pattern and Decoration movement that appeared in the U.S. later that decade, but the painting’s austere intellection undercuts any sense of spectacle, even as its bright, complementary colors and surprising shape spread open like a joyful outburst (calling to mind Emma Goldman’s famous maxim, “If I can’t dance, I don’t want to be part of your revolution”). With fellow French artists such as Bioulès, Cane and Dezeuze he founded the [Supports/Surfaces] group after a period of intense experimentation in the south of France, where he installed his works in various non-institutional spaces such as farms, a beach, the bed of a river, etc. In a context of radical questioning social norms and values, the artists attempted to break up the convention of painting by deconstructing the concept of the stretcher (support) and canvas (surfaces). As artists attempting to navigate a culture whose upper echelons catered exclusively, then as now, to the interests of corporate capitalism, the members of Supports/Surfaces refused to surrender what they deeply loved — the touch of the physical object — to the corruptions of the art trade, even if they had to go to “farms, a beach, the bed of a river” to reclaim it. Supports/Surfaces continues at CANADA (333 Broome Street, Lower East Side, Manhattan) through July 20.